Southern Baptist megachurch pastor Robert Jeffress has said that he disagrees with Christian author Max Lucado when it comes to Republican presidential nominee Donald Trump, explaining that he wants to see the "meanest, toughest" option for fighting the Islamic State terror group and other threats. 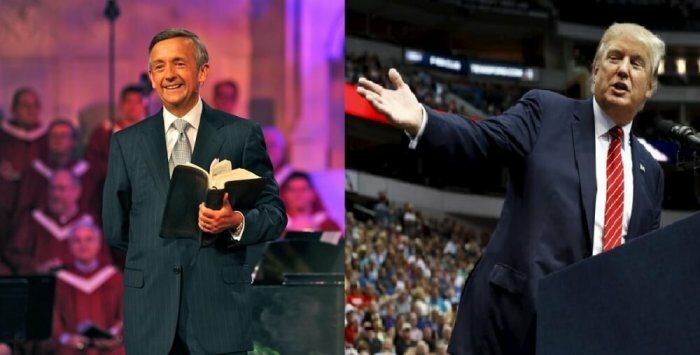 Jeffress, who leads First Baptist Church in Dallas, Texas, said in an interview with NPR that while he "loves" and agrees on certain things with Lucado, he disagrees on what qualities are needed for president. "Well, first of all, I see a lot of common ground with Max Lucado. I love Max Lucado. And, you know, I've disagreed with his point of view," Jeffress explained. "When I'm looking for a leader who's going to fight ISIS and keep this nation secure, I don't want some meek and mild leader or somebody who's going to turn the other cheek. I've said I want the meanest, toughest SOB I can find to protect this nation," he continued. "And so that's why Trump's tone doesn't bother me. But having said that, I do agree with Max Lucado. There needs to be unity, especially in the body of Christ." The Dallas pastor has in the past criticized Christians opposed to Trump, calling them "weak," "namby-pamby" and too "proud," because their preferred Republican candidate did not win the primary. But Lucado, who ministers at the Oak Hills Church in San Antonio, Texas, has argued that a candidate who claims to be a Christian needs to talk and act like one. "If the candidate does what Trump has done, wave a Bible and attempt to quote from it, then we, his fellow Christians need to call him to at least a modicum of Christian behavior, right?" Lucado has asked. In another Op-Ed published in The Christian Post last week, the Christian author said that regardless of who wins the presidential election on November 8, God will still be in charge, and believers need to come together in unity. "His throne will still be occupied. He will still manage the affairs of the world. Never before has His providence depended on a king, president, or ruler. And it won't on November 9, 2016. 'The LORD can control a king's mind as he controls a river; he can direct it as he pleases' (Proverbs 21:1 NCV)," Lucado wrote. Christians in America continue debating where they stand on the candidacy of Trump, however, especially in light of leaked audio tapes from 2005 where he is heard making lewd comments toward women, and in the face of several allegations from other women who have said that Trump sexually assaulted them — something that the Republican nominee denies. In his interview with NPR, Jeffress said that in the past, evangelicals have had to make other tough choices as well, but positioned that voting for the best leader for president is not the same thing as endorsing that person's personal failures. "You know, in 1980, evangelicals overwhelmingly elected a candidate who was a known womanizer when he was in Hollywood. He would be the first divorced president in U.S. history. His name was Ronald Reagan. And when evangelicals voted for Reagan, they weren't endorsing womanizing. They weren't endorsing divorce. They were endorsing Reagan's policies," the pastor said. He added: "I think most of our members are mature enough to understand that by voting for a candidate, they're not endorsing a particular lifestyle. They're simply voting on the issues. And, you know, I read just this week a Christian blogger who said she had been a victim of sexual assault and she could not support Donald Trump. And I can understand that. I can sympathize with that."